How would you like more business coming through your door as qualified leads? Or perhaps you are an undervalued in-house SEO that would like to be able to compare your achievements against your peers? 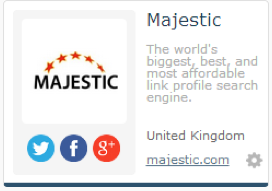 Majestic have so many people asking about who we might recommend, so we decided to let our customers list themselves on our site through a new business pages listing. 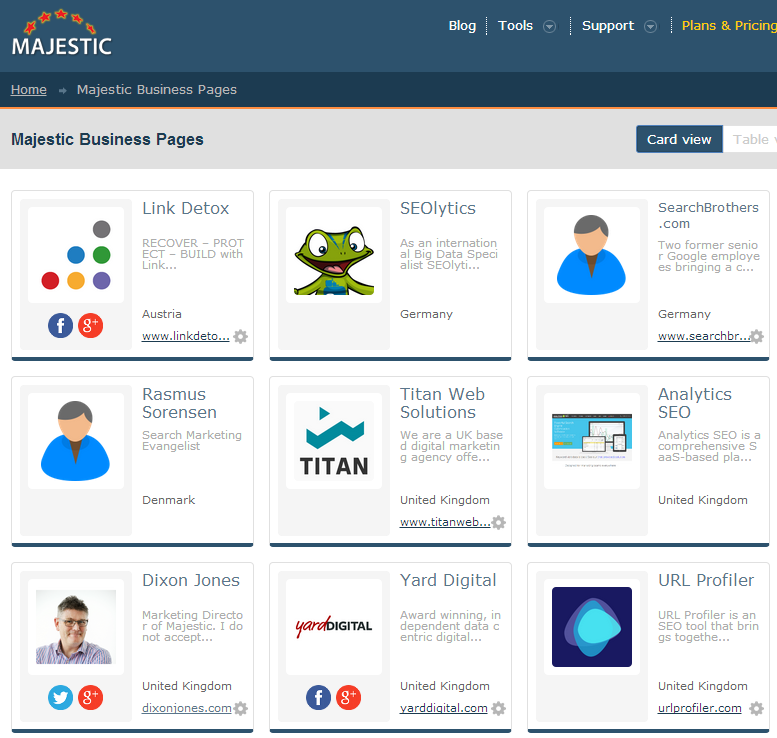 This will be more than just a directory – it will look to intelligently inform your potential clients about who has the experience and the knowledge to use Majestic. We will look to match buyers with the right experts for them. Matchmaking for SEOs. These smart looking cards are just one visual representation that we are working on. The Business Pages will not work like a traditional directory – instead we will make them interactive. You will remain in control of your profile listing – and even whether it is visible to others on the web. We will not share your details without your express permission, and all listings will be manually reviewed for quality before being accepted into the business pages. If you want to be brutal about it, a (no-followed) link if you want. Profile URLs will be on a first come first served, no reserves basis. I would recommend you submitting your profile for review now, so that you will not be disappointed later. The submission form will give you total control over what you let our visitors see. You will be able to change your profile over time as well. What is in it for Majestic’s visitors? It is not just a profile, but a chance to show your customers that you know Majestic. Majestic will be enhancing information not about YOU, but about how well you know Majestic. So the earlier you register for example, the more experience you’ll be showing from day one. But that is not all that we will be able to give to our visitors, they may want to find an SEO near them, or one with a certain level of subscription. 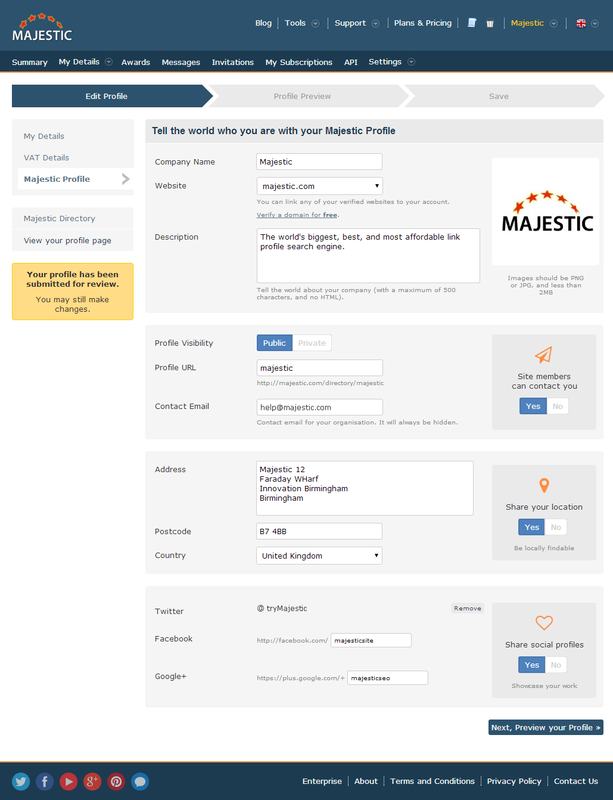 The more you engage with Majestic, the better your visibility in our business pages. More of that at a later launch date, but here’s a mock up of how a business pages listing might look. How Can I Submit my Profile? Oh yes… nearly forgot that. Paid users (only) can reserve their profiles here.